Ipomoea oenotheroides (L.f.) Raf. ex Hallier f.
An eye-catching, drought-resistant shrublet with bright pink ‘morning glory’ flowers in summer and silvery stems sprouting from inedible tuberous roots. Because it flowers at Christmas time, it is known as Christmas flower. Ipomoea oenotheroides is a much-branched shrublet, up to 1 m high. Silvery hairy stems with multiple branches are produced from a large tuberous rootstock. The roots are slender, spindle-shaped and up to 1.25 m long. Leaves are narrow, green, folded, 20–80 mm long, hairy underneath, with acute or obtuse apex and entire margin. It produces funnel-shaped flowers, 30–60 mm long and wide, with 5 corolla lobes, bright pink with dark purple centres in summer (November–March). The flowers open in the morning and close in the afternoon. Fruits are ovoid-globose, dark brown, 15–20 mm long, containing 1–3 seeds, about 9 mm long. 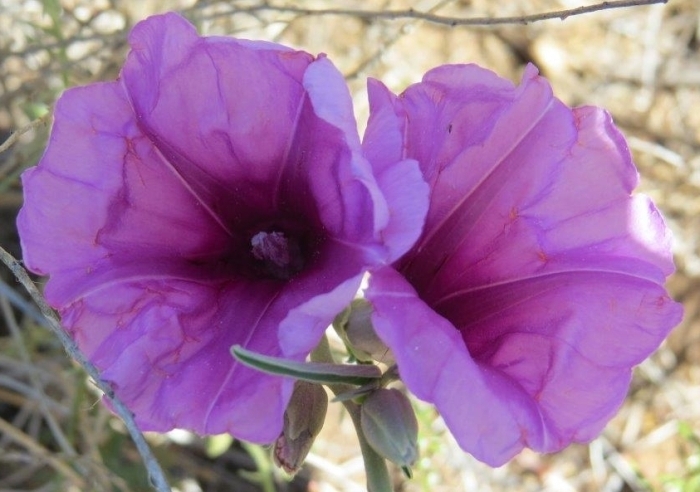 According to the Red List of South African plants website, the conservation status of Ipomoea oenotheroides is assessed as Least Concern (LC). Ipomoea oenotheroides is endemic to southern Africa. 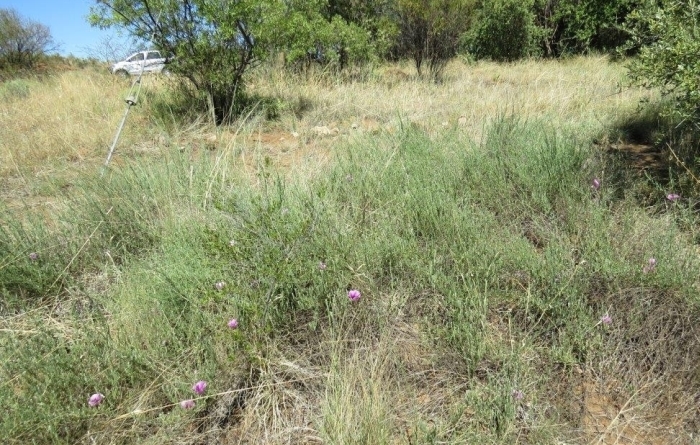 It grows in grassland, koppies and semi-karroid areas often along the road, in the central parts of South Africa, in the Free State (Fauresmith, Bloemfontein, Senekal, Kroonstad and Vredefort), Gauteng, KwaZulu-Natal, Eastern and Northern Cape and North West Provinces, and in Namibia. It is most common in the arid parts of the summer-rainfall region. The name Ipomoea is derived from two Greek words, ips meaning ‘worm’ or ‘bindweed’ and homoios meaning ‘like’, referring to the creeping and twining habit typical of plants of the genus. The species name oenotheroides means ‘resembling the genus Oenothera’, commonly called evening primrose. There are more than 500 plant species under the genus Ipomoea, occurring in tropical and subtropical regions of the world, and 49 species are indigenous to southern Africa. This genus is well known for its showy morning glory vines, but its most famous member is probably the sweet potato, Ipomoea batatas, which is indigenous to Central and South America, but is now grown as a crop throughout the world. The large flowers of Ipomoea oenotheroides attract insects, including ants and bees, that pollinate the flowers. CMR beetles and caterpillars of certain Lepidoptera feed on Ipomoea species. Because of its colourful pink flowers, it is used for ornamental purposes. Although Ipomoea oenotheroides is not reported to be used in traditional medicine or in religious rituals, several species of Ipomoea are used to treat a variety of diseases, such as diabetes, hypertension, dysentery, constipation, fatigue, arthritis, rheumatism, hydrocephaly and kidney ailments, and as charms for love, good luck, fertility and protection. Similarly, although the tuberous roots of Ipomoea oenotheroides are inedible, the roots of several other species including I. simplex and I. crassipes are eaten, and the leaves of I. obscura and I. papilio are eaten like spinach. Ipomoea oenotheroides can be propagated by division of tubers, cuttings and seeds. Treat the cuttings with a rooting hormone to stimulate rooting and do not allow the cuttings to dry out. Allow the seeds to mature on the plant and sow in spring or summer. Plant it in full sun or semi shade in a well-drained soil. Allow the plants to remain dry during the winter dormant season. Ipomoea oenotheroides is water-wise and frost hardy, and well suited to grassland and Highveld gardens. Flora of southern Africa entry for Ipomoea oenotheroides. Accessed via JSTOR Global Plants on 21/01/18. Foden, W. & Potter, L. 2005. Ipomoea oenotheroides (L.f.) Raf. ex Hallier f. National Assessment: Red List of South African plants version 2017.1. Accessed on 2019/01/19. Fox, F.W. & Norwood Young, E. 1982. Food from the veld: edible wild plants of southern Africa. Delta Books, Cape Town. Manning, J. 2001. Eastern Cape wild flower guide. Botanical Society of South Africa, Cape Town. Pereira da Silva, E., Meira, M., Juceni, P.D. & Jorge, M.D. 2012. Review of the genus Ipomoea traditional uses, chemistry and biological activities. Journal of Pharmacognosy 22 (3): 682–713. Retief, E. & Meyer, N.L. 2017. Plants of the Free State inventory and identification guide. Strelitzia 38. South African National Biodiversity Institute, Pretoria. Van Wyk, B. & Malan, S. 1997. Field guide to the wild flowers of the Highveld. Struik Publishers, Cape Town. Van Wyk, B. 2015. Pocket guide: Wild flowers of South Africa. Struik Nature, Cape Town.